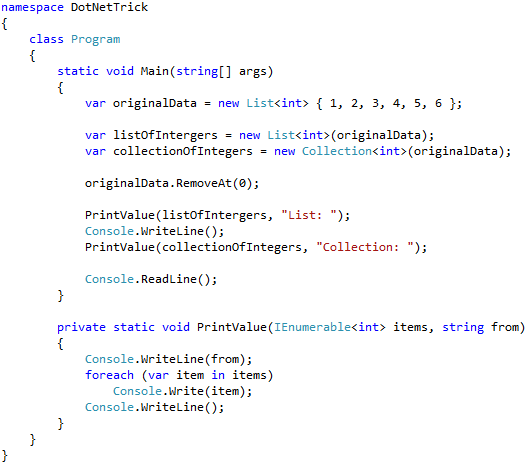 To convert string in title case is bit tedious and may require lot of code as there is no direct method available in C#.Net in String class. So, here I am sharing a method, which will be the extension method for String class and can be used to convert given string to title case. Here I am using CultureInfo from Globalization and ToTitleCase method of TextInfo class. Nowadays, we see that software development process is shifting from enterprise-driven process to consumer-focused approach, in which applications are fully based on the taste of consumer market and the devices they want to use. And the speed at which these devices and platform are emerging, it is becoming more and more challenging for developers. Earlier applications were used to run on a server or a desktop but today many more devices like smartphones, tablets are becoming ubiquitous. So, in this case developer must either create applications that work on multiple platforms or make applications tailored to each platform with similar logic and the most important thing is, there should be a connected experience that allow user to seamlessly move among all these devices and platforms. But as long as Microsoft is with developers, developers need not worry. Agree ??? Launch of Visual Studio 2012 solved a lot of problems. Now instead of the developer worrying about platform and devices, Visual Studio will take care of it. Isn't it good? Visual Studio 2012 makes it easy to develop apps for multiple platforms including Windows Smartphones, slates, Xbox and of course traditional desktops. With the birth of Portable Libraries, developer can write and compile the code once and then deploy the assembly anywhere. Enhanced version of Team Foundation Server is another major addition. Continuing to all these, one major change are App Store which help consumer to quickly search and acquire the required application software. In App Store, Applications can be monetized also either by charging or including advertisements in the application. 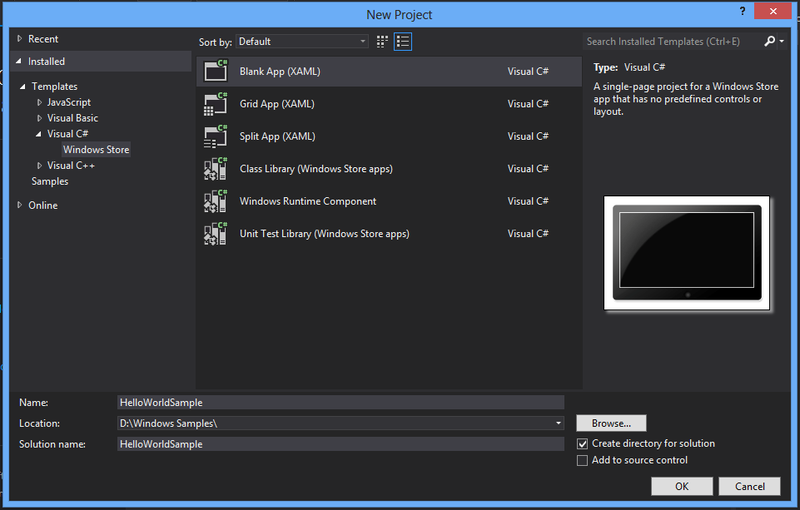 Visual Studio 2012 provides integrated tools to publish our applications in this app store. 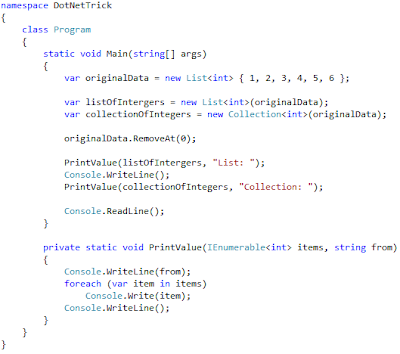 Interface of Visual Studio is redesigned in order to remove significant clutter from the screen, while still providing a fast access to major features. Visual Studio 2012 is not only for developers, but many other people like stakeholders, architects, project managers, designers, testers etc. Visual Studio 2012 supports developers by enabling them to create solutions that are highly scalable, supporting a range of models from durable full duplex synchronous services to high-throughput asynchronous services. Developing a scalable solution is only half the challenge: You must also provide a suitable environment to act as a host. With Visual Studio you can develop for a range of infrastructure choices. Whether you choose to target a physical server, a virtual server, or a private or public cloud, Visual Studio 2012 is your solution. If you decide to use the Windows Azure™ public cloud offering, you can deploy directly from Visual Studio to the cloud. Visual Studio also includes IIS Express (lightweight IIS), which is suitable for testing the apps. It enables stakeholders to participate as equally as developers throughout the application life cycle and help developers in faster delivery with more business value. As earlier version, Visual Studio TFS can be installed on local server but in Visual Studio 2012, Team Foundation Server is available as an online SaaS version. Sometimes, some teams may be using a different development environment, such as Eclipse™. 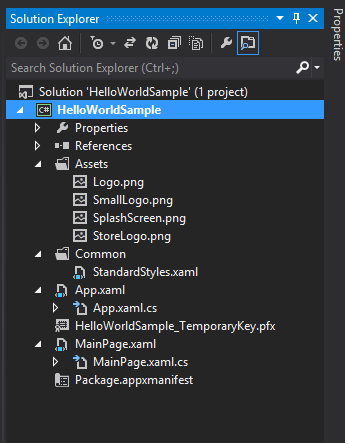 Visual Studio Team Foundation Server 2012 provides adapters to connect to supported IDEs so that developers can work in their preferred development environment. It enables developer to create more stunning applications using XAML. Portability between Visual Studio 2012 and Blend has been improved, and the design surface in Visual Studio has been upgraded to more closely match the experience in Blend. 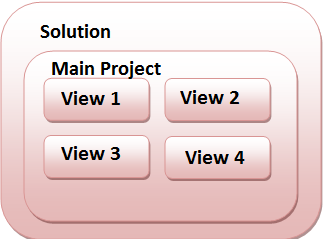 This helps testing process to fully integrate into Software Development Life Cycle (SDLC). Using this test cases and testing can be performed more quicker using the same tools as developers. Testing on remote devices without installing Visual Studio 2012 or Test Manager on the device itself (only a small test agent need to be installed on the device). There are lots of interesting facts, which are associated with Visual Studio 2012, which I'll be posting as and when I'll get time. Continuing to my previous article title, here we will see about splash screens, how to set the splash screen image and how to change the background color. 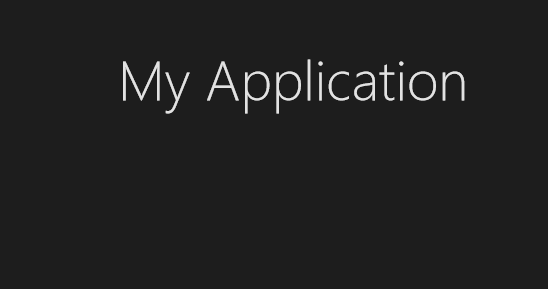 Every Windows Store app must have splash screen. Splash screen consists of image and a background color. Whenever the user will launch application, splash screen will be the first to come up. Now you might be thinking, what is the purpose of splash screen??? We all know that, whenever any application is launched, lot many things happened at backend before our application is fully launched. So, splash screen provides a way to hide all those background details from the user. This splash screen is launched, when application is initialized and as soon as our application is ready for interaction, this splash screen goes off. Isn't it a nice thing ? If you want to change this default image, then click on browse the browse button to select the image of your choice. Note: Please make sure that the image you are selecting must be of 620 x 300 pixels. Now coming to Background Color, it is also pretty simple. In the Splash Screen sectioour n, you will find the field with title Background Color. You can enter the color of your choice in this field. Setting of background color is optional for splash screen. BE careful while customizing the splash screen: As it is the first screen or let's say welcome screen of our app, it should have a good combination of image and background color. It should be very appealing. Here one thing to keep in mind is, when your application is launched, only the background color is adjusted as per the screen size, not the image size. Image size will always be intact. If you feel that your application needs to perform lots of background tasks before the user interation can happen or before the landing page appears, then extend your splash screen in a way, that it gives user a pleasing experience, instead of annoying. Alternatively, you can provide additional information on the splash screen, in order to keep user busy by showing more interesting information about your application. The purpose of splash screen is to let user know that app is loading, using the same for advertising and other useless stuff can confuse user also. The main purpose of splash screen is to give user a smooth loading experience. So, your splash screen should never show information about version, date , etc. If you feel that your application is going to take more than a few seconds, then it is always good to show user a progress bar about application loading process. 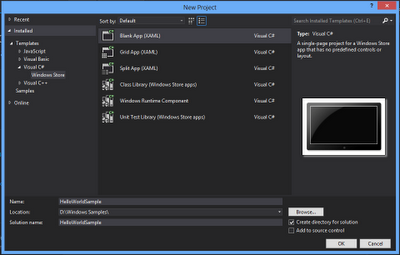 In this tutorial we will be creating a very basic Windows Store App using XAML and C#. As this is the very first tutorial of this series, I'll be focusing mainly on project setup and basic workflows and later on, in other upcoming series, I'll be picking up more advance concepts. So, before moving forward, let's talk about the environment setup to execute our app. In the left panel, you can select 'Windows Store' template. Once selected, center pane will show you the list of available items for the selected template. Here we are using Blank App, which will not contain any user controls by default. If require, we can add the controls at later point of time. Here you will see that, your solution contains lots of file. I'll try to brief about each of these items. These above files are required for all Windows Store apps, which are built using XAML and C#. While using Blank App template, we can replace our blank page with any other page templates, in order to take advantage of layout and other helper classes. Click Yes, to add these files. You will see, all the newly added files under the Common folder. At this point of time, there is no button to close the app. So, you can use Alt+F4 to close it, typically we don't close Windows App (what is the reason behind this, we will see in our next article of this series). Now press the Windows key, you will be able to see a new tile added for your new app. Now to run the app, you can click or tap on that directly. Isn't it a good feature ??? 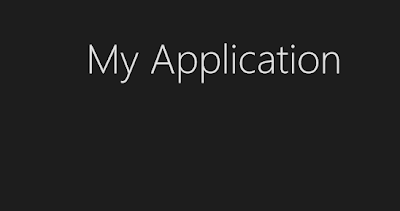 Congratulations on building your first Windows store app. /// <param name="args" />Details about the launch request and process. /// <param name="sender" />The source of the suspend request. /// <param name="e" />Details about the suspend request. 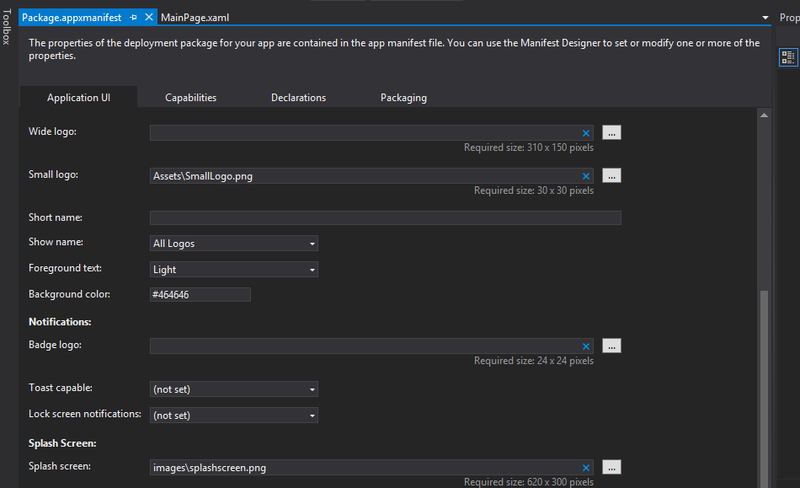 Now moving to MainPage.xaml. This file defines the UI for your app. In code behind of this file, you will notice that, it uses LayoutAwarePage, which extends Page class and provides various mathods for navigation, view management and page management. 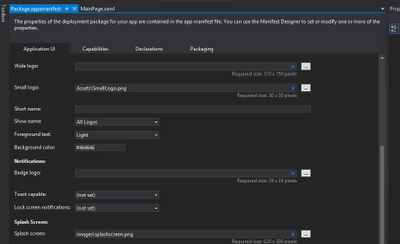 In MainPage.xaml.cs file, you can add logic and event handlers for your application. The Basic Page template has two mathods, which you can use to save and load the page state. Hope this material will be a very good start for beginners. And you are done. Now access the internet and your issue is resolved.